An exercise session in the morning before you head to school gets your heart pumping and can provide an energy boost. It may give you more motivation to tackle your day of classes, and the thought of exercising will not longer be looming over you all day. Convincing yourself to leave your warm bed earlier than usual isn't always easy, however. 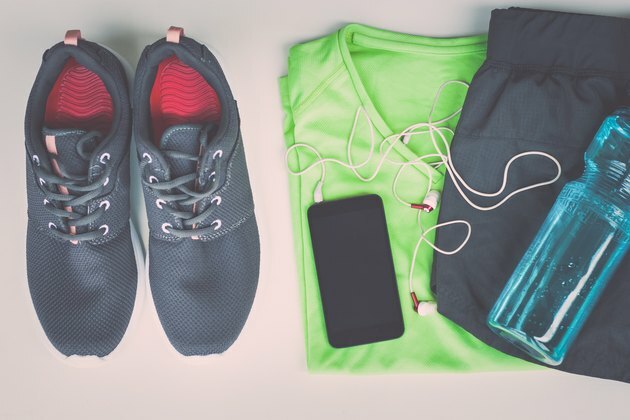 Preparation the night before gives you a jump-start so you are more motivated to start your exercise. Calculate what time you will need to go to bed in order to get plenty of rest. Determine what time you need to leave for school, the length of your workout and the amount of time you'll need to get ready for school. Do a test run on the weekend to make sure you have enough time without making yourself late to school. Hang your workout clothes and school clothes at the front of your closet the night before. This saves you time in the morning because you won't have to pick out an outfit. Set out your shoes and accessories as well. Prepare your school lunch the night before. Gather all of your homework and other items you need to take to school and put them in your bag. Place the bag by the door so you don't have to search for it. Complete your workout within the time frame you calculated. Plan out your exercise routine the night before so you can start it immediately without deciding what to do first. Eat breakfast after your workout to refuel your body. Pack the breakfast to go if you won't have enough time to eat it before you head to school. Walking, skating or biking to school is a good way to exercise in the morning while also covering your transportation. This may save you time since the exercise session doubles as your commute. Check with your doctor prior to starting a new exercise program, especially if you are already suffering from a health condition.